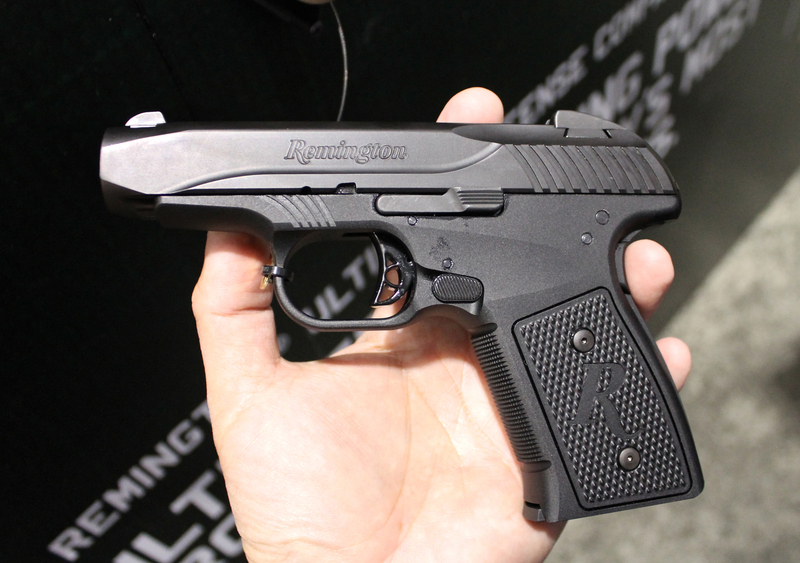 Remington Arms Company is introducing the new R51, a modern interpretation of the the Remington Model 51 “pocket pistol” from the turn of the century. 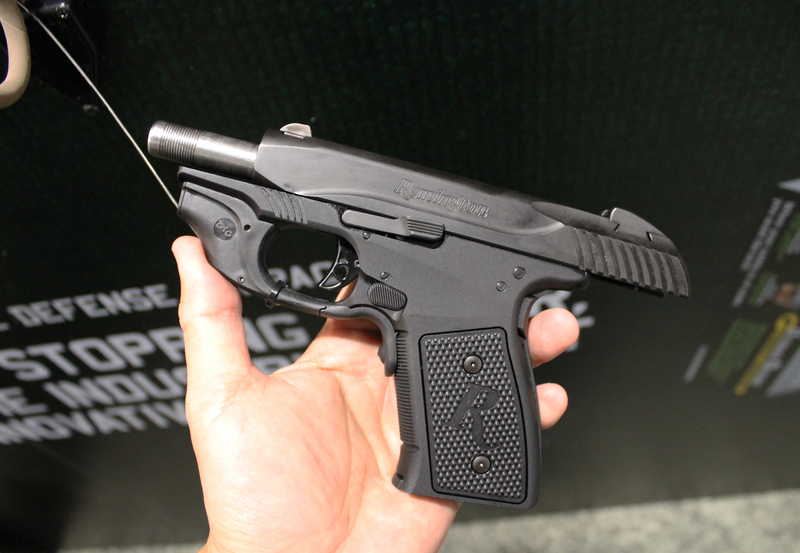 The R51 is intended to be a 9mm Parabellum concealed carry pistol with a single-stacked magazine and 7+1 round capacity. Its futuristic looking exterior disguises 100-year-old technology—in a good way. The original pistol was designed in 1917 by John Pedersen and incorporated his locking breech block and hesitation-locked action. Yeah, I’m not sure exactly how those work, either. But they do provide a low bore axis for the R51’s fixed barrel. Remington goes on to say the Pedersen action absorbs some of the kick as it cycles. 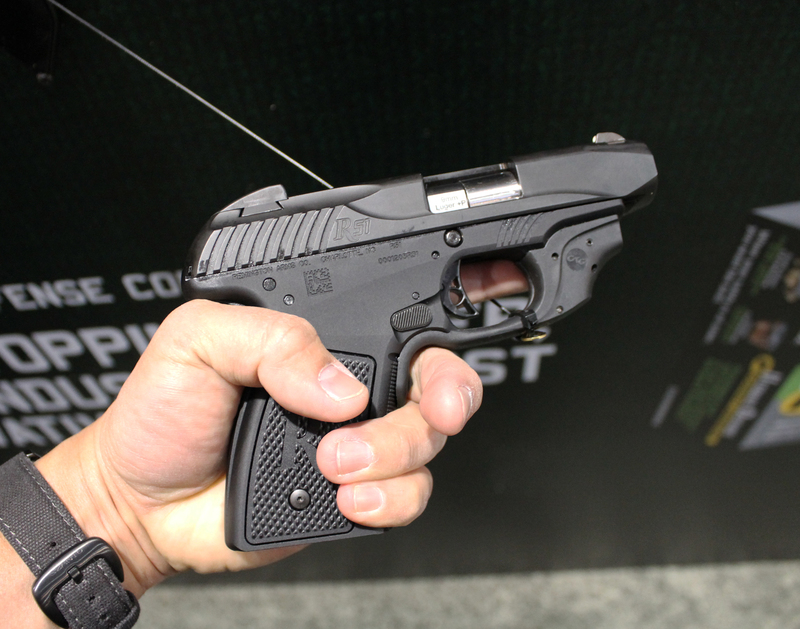 Big Green touts these as giving the gun a 25% reduction in felt recoil. That should help calm the 9mm +P’s for which the gun is rated. R51 is hammer-fired. 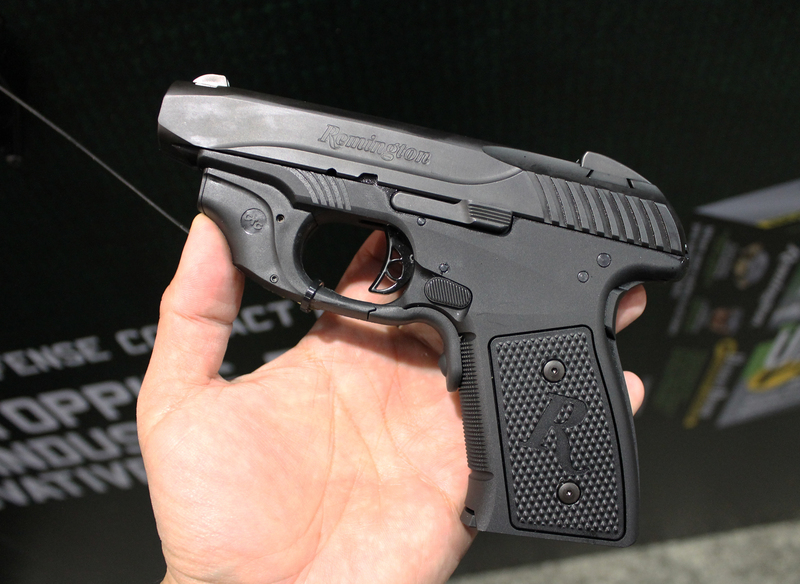 It has a long-pull single action trigger. I dry fired two different R51’s at the Remington SHOT Show booth. I thought one trigger was great while the other was mediocre. Maybe it was me, because the other guys I talked to said they thought the triggers were smooth with an easy pull. 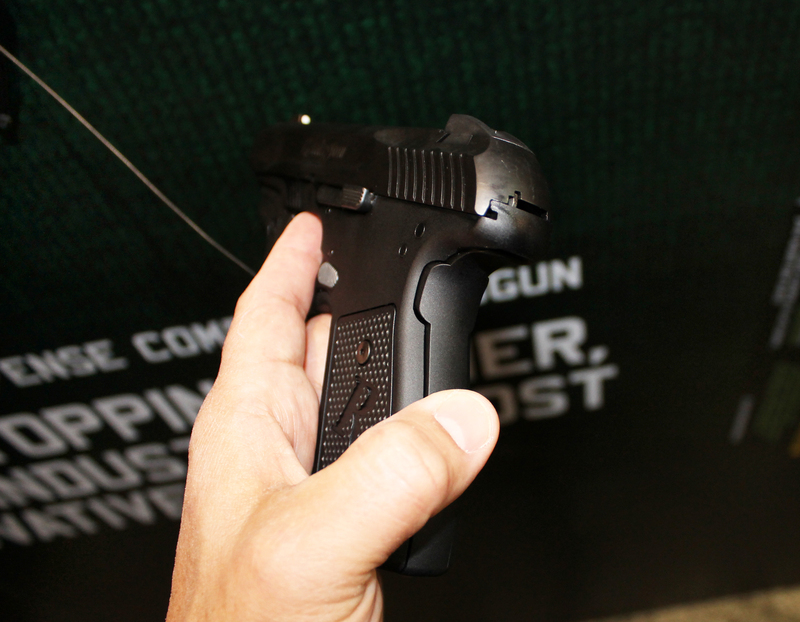 In case you are worried about the SA bang switch, a grip safety on the backstrap deactivates positively with light pressure from the web of the hand. Under the skeletonized trigger, the trigger guard is undercut to get your fingers a bit higher on the front strap, which is checkered at 25 lines per inch. Magazine releases are found on both sides of the very aluminum frame. 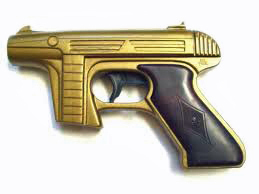 Did I mention that this is a metal gun? Well, the grip scales are polymer. I have heard the words “pocket pistol” and “sub-compact” used to describe the R51. They better describe the older Model 51. Both guns are of a comparable size: a little over 6 1/2 inches in length, around 1 inch in width, and just at 22 ounces in weight. 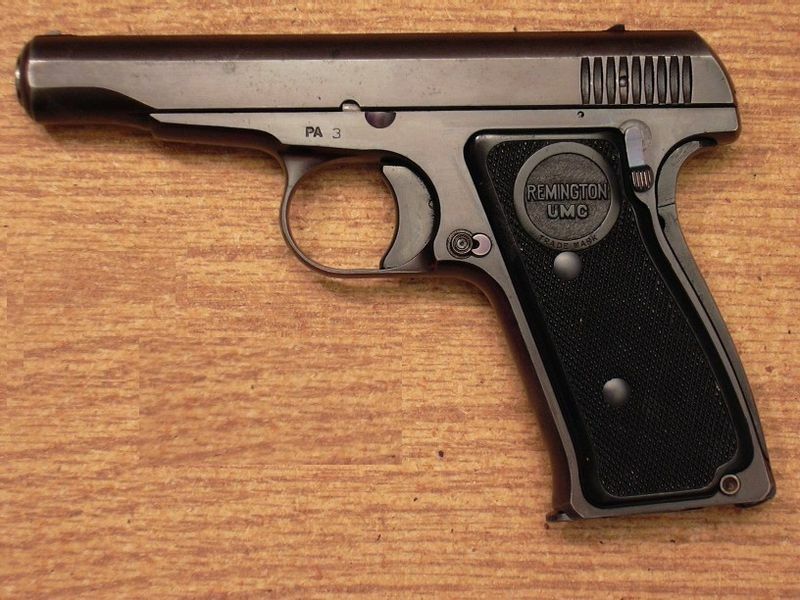 In its time, the Model 51 was considered a pocket gun. This is not true of the R51 in 2014. It is more accurately called a compact. After I had made a beeline for the Glock 42 at Media Day at the Range, I immediately went in search of a Remington R51 to shoot. Remington Gunner Travis Tomasie said he had been carrying his R51 for a few months and he really liked it. In the swirling dust of the shooting lanes, he sheepishly apologized that no R51’s were at the range for us. Dang it! This led to conspiracy theories about the R51 amongst the assembled Press Corps during the week. No R51 at Media Day? There were whisperings, rumors, clandestine meetings in parking garages. It seemed the like Remington booth became aRea 51, a place of secrets and speculation. Since other invited Media had gone to Gunsite Academy in Paulden, AZ last December to fire thousands of rounds through R51’s, I was not moved by the conjecture. Okay, maybe a little. 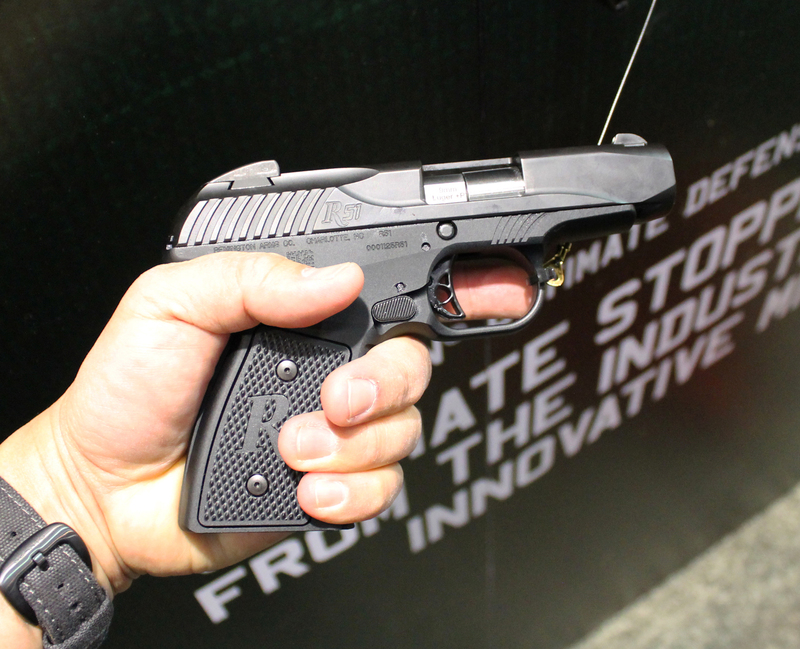 Remington said the new R51 will be shipping on February 1 with an MSRP of $389.00. There is also a Crimson Trace laser-equipped R51. Companies Fobus, Galco, Crossbreed and others are supposed to have holsters ready at the gun’s release. I still just want to shoot the R51. The rounded design reminds me of the plastic Star Trek disk-shooting phasers from my youth. The future is truly grounded in the past. This entry was posted in Concealed Carry, Firearms, Off Duty and tagged concealed carry gun, Police Back-Up Gun, Remington, SHOT Show. Bookmark the permalink. Just want to know how it shoots, how tightly, more about the trigger, etc. I would buy one as soon as I move from “Taxichusettes”. Nice work, Remington!! Go ahead and get one, I became determined to get one and did. I got the new smoke/silver edition. Beautiful gun! There’s a bad rap on them still though, I cleaned the gun right off the bat and ran 100 Blazer FMJ rounds through it with only 1 miss feed at about the 40th round mark. I disassembled and inspected it after the initial 100, cleaned and ran another 500 rounds through it with no issues. Two thumbs up on my unit. Nice work Remington! I was a little nervous, but I dared to be different and it paid off.